Bridgeport Mighty-Move Expansion coupling of 3/4-Inch trade size, provides set screw connection to join two lengths of EMT. This 6-Inch expansion coupling has an expansion length of 1-1/16-inches to couple with EMT fitting. The coupling in zinc-plated finish, has steel construction for strength and durability. 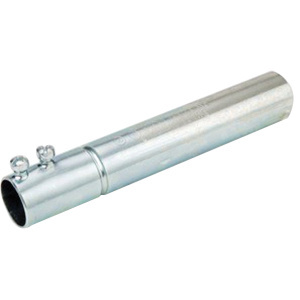 This expansion coupling is suitable for use with EMT conduits for up to plus or minus 2-Inch of conduit movement. It is ideal for use with an optional bonding jumper. Expansion coupling meets cULus, UL 514B, E24001 and RoHS standards.